While we (im)patiently wait for the MK7 Jetta GLI to debut, here’s a little something to start you drooling. This MK1 Jetta GLI is far from stock, but oh so perfect. This Find of the Day would look great parked in your driveway. While the GTI gets all the street cred, the Jetta GLI has been Volkswagen’s budget performance sedan. The hatch has a playful image about it, while the notch is a little more mature and laid back. Looks aside, these cars went like stink in an era where 0 to 60 times were measured in double digits. And while other cars may have been faster in a straight line, the MK1 G-models could zip circles around them with one rear tire stuck up in the air. 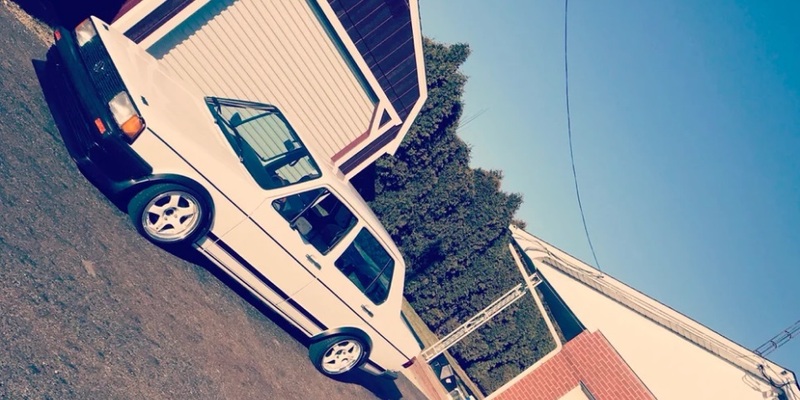 This 1984 GLI takes the inherent goodness of the people’s sports sedan and kicks it up a notch. 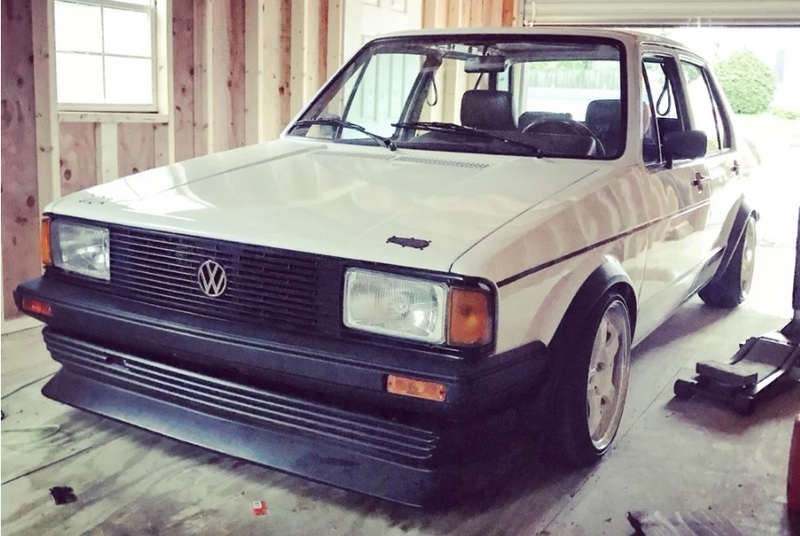 VWVortex member dubberscrubber has built a tasteful little ride. To start, there’s a 123HP 1.8L 16-valve engine from a MK2 Scirocco under the hood. Back in 1987 the ‘Rocco hit 60 in 8 seconds. The GLI weighs somewhere between 200 and 400 pounds less than the sporty coupe (conflicting weights on different sites), so it’s going to be even faster. The slim Euro bumpers further reduce weight. A nice start to this FOTD, right? The fun doesn’t stop there. The car rides on BC Racing coilovers that not only tighten up the handling but lower the center of gravity as well. There’s also the wide SSR Performance wheels with sticky Achilles tires. This thing is begging to hit the twisties. The mods don’t stop there. 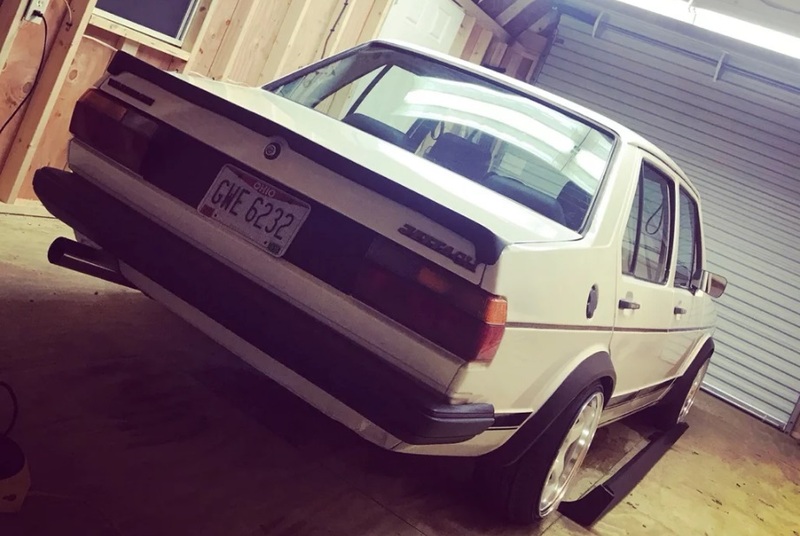 There’s the already mentioned Euro bumpers, Euro headlights, Euro grille, rare Zender front air dam, restored wheel arches, restored GLI striping, and much more. The car even comes with the original headlight setup, OEM grille, and an uninstalled body kit. There are just a few flaws: there’s no headliner, there’s some dings and scratches, and the blower fan is a bit wonky. But as dubberscrubber points out, it’s a 33-year-old car. If you’re interested, the car can be seen in Canton Ohio (south of Cleveland). Check out the ad in our classifieds. The current asking price is $4500 (we think). Dubberscrubber states the price has been reduced for the next two weeks, but it will go up later. It’s not clear if the $4500 is the adjusted price or the original price. Best to contact him to confirm.